Are you ready for this summer’s blockbuster monster movie? This year we’ve been uber-fortunate to have a steady stream of SciFi blockbuster movies. Next up is Pacific Rim. This one promises to bring to life every kid’s fantasy of saving the world by controlling a giant robot to fight monsters. At heart it seems to be your typical ‘unlikely heroes save the world against all odds’ story, but Director Guillermo del Toro has ceased the opportunity to create something more. Known for fantasy movies like Pan’s Labyrinth, Hellboy, and The Hobbit; del Toro is comfortable bringing fantastical tales to life on the big screen. This time he has taken the basic action flick and used it to create what promises to be a richly detailed alternate or perhaps futuristic version of Earth in which giant robots fight alien monsters. This isn’t just our world with a few toys dropped in, he has gone way beyond that and part of that was brought to life in the artistic look of the film. 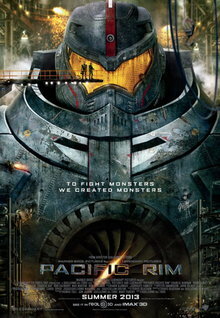 Pacific Rim is due out July 12 in the US and UK, July 11 in Australia, and August 9 in Japan. Anyone out there excited about this film?